Fikri Jermadi thinks it would be a good Ida to check this film out. He was not mistaken. From the first frames of this film, I initially thought something was wrong with the projector. It seems like everything is a bit off, with the characters all positioned within very small confines on the silver screen. The aspect ratio, too, was not conventional; 4:3 ruled the roost back in the day, but nowadays 16:9 is so dominant is even transforms how laptop manufacturers size their own screens. All that was done with the aim of creating a more cinematic experience. As challenges from new forms of media forced the film industry into a rethink, it became imperative for them to offer something that would not usually be as available outside of the movie theatres. Things became wider, if not necessarily bigger, and now that is the convention for pretty much everything, really. 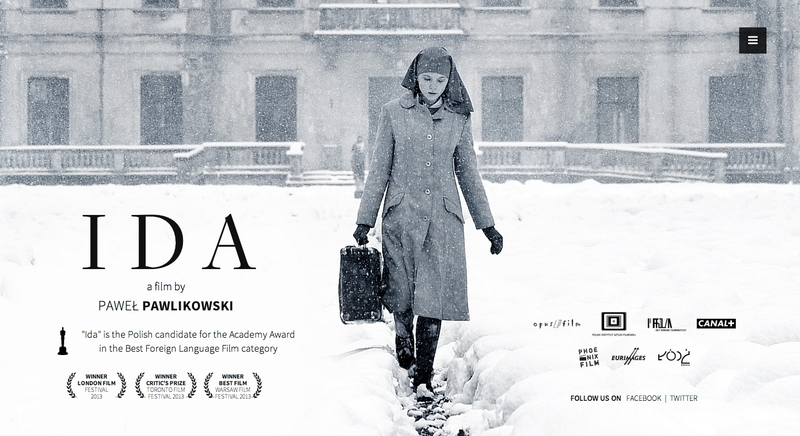 ‘Ida’, then, is a step back into the past to recreate and evoke certain emotions. It tells the story of a young lady, Anna (Agata Trzebuchowska). She is a novitiate, a young nun biding her time to take her vows. However, before doing that, a visit must be paid to her only surviving relative, Wanda (Agata Kulesza). She is a judge, and the complete opposite of Anna’s chaste character; smoking, drinking and sleeping around with almost reckless abandon, she could not be any more different. She is also the one who told Anna that her real name is actually Ida, and that she is a Jew. That must have been something of a shock, I should imagine, and it was the trigger that really set the whole story in motion, really. Driven by that revelation, Anna/Ida started to ask more questions about her family, and they both set off on a journey to find out what happened to them. And…that’s about it, to be honest. Essentially, the film deals with the idea of the home (the director himself was born in Poland, but was bred in England). The trauma of the past was clear for all to see. I had suspected this to be set slightly after the Second World War, and subsequent research revealed it to be in the 1960s, so the horrors of the war would still be somewhat fresh in their minds. It is not all that impossible a task to find out what happened to their family. It is not an accident that one of the first places they visit is their old home. The physical structure becomes an embodiment for the spiritual one, with a new family living in their old home. That family is Christian, and their treatment of both Ida and Wanda were reflective of the disdain held for other Jews of that time. Again, the idea of the homes is evoked, with the Jews hounded out of the places they have called home for years. Of course, we don’t actually see what in the sense that it’s shown on screen. What we do see is a very confident composition of things. I mentioned earlier of how the framing seemed a bit off at times. It was off, but that was because of a number of reasons. One, the aspect ratio deployed by the director Pawel Pawlikowski evoked memories of years gone by, when everything was indeed in 4:3. This film, through its form, attempts to recreate past aesthetics, the medium mirroring its message. It may not have been what Marshall McLuhan had in mind when he hypothesised it, but certain the principles are applicable, as the medium did indeed become a part of the message. The second reason it was framed as such is because the headspace is huge. I am aware of artistic considerations, and in wide shots in other films there are often plenty of headspace that even the Chelsea Football Club team bus should have no trouble negotiating. It is clearly deliberate, but after a while, I came to realise that it represents, perhaps, the presence of God. God, in essence, is everywhere, even beyond the confines of what many would consider to be his home; that omnipresence translates into a bigger space in the frame above the characters heads, reminding us of how miniscule our position in the bigger picture is. Perhaps miniscule is to big (or small?) a word, and perhaps I am guilty of reading too much into the film. The fact remains, though, that I believe this to be a film constructed deliberately to evoke certain emotions. The camera does not really move much beyond its position on its sticks. I am reminded of ‘The White Ribbon’, a film directed by Michael Haneke some years ago. Its cinematographer, Christian Berger, was also nominated in the Best Cinematography and Best Foreign Language Film at the 2010 Academy Awards, much like ‘Ida’ is this year. Let that not take anything away from the performers on screen. The medium might well be (at least a part of) the message, but the message was certainly delivered adroitly by two very contrasting characters, played by two very different performers. Both are named Agata as well, and both were equally convincing. Special props must go to Agata Trzebuchowska; apparently this is her debut performance after being discovered while reading a book in a café. Can you get any more stereotypical? There certainly is nothing stereotypical about this film, though. Ultimately, the text as a whole challenges my own ideas and perceptions of many things, and it serves as a useful reminder not only of how beautiful black and white cinematography can be, but also how contrasts can be further highlighted by different characters, of how they can be both the protagonist and antagonist at the same time (Ida is the eponymous character here, of course, but I’d argue that Wanda is also a protagonist in her own right). This film holds me right through to the very end, leaving me intrigued with the developments of the different characters. I don’t know what kind of chances it has of winning this year’s Best Foreign Language Film award, but much like ‘Tangerines’, it leaves me wanting to know more about its story and the stories behind it. That’s never a bad Ida.